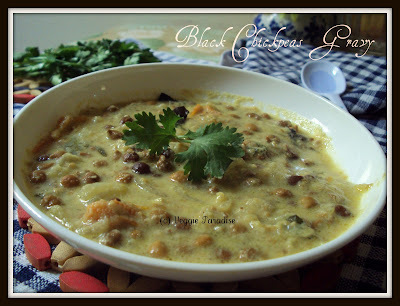 Black Chick peas in coconut gravy. This is a delicious healthy gravy with black chick peas. Grind them to a smooth paste adding little water. Soak the chick peas overnight . In a cooker, cook them with a pinch of salt. Allow it for 3 - 4 whistles. Heat oil in a pan, Add all the seasoning ingredients, sauté for a min. Add the coriander and mint leaves, sauté for a min. Add the onions, saute them until they turn translucent. Add the tomatoes, along with turmeric powder, saute them until the tomatoes get cooked well. Now add the cooked chick peas mix them well,add the paste adding little water , allow it to cook for 10 mins in medium flame. ( adjust water according to your consistency). Aruna, black chana curry looks delicious dear. Black chana is more healthier than white one dear nowadays i start to use black one. Very nice and tasty curry. Ur version looks good. Thats a very nice recipe. Thanks for sharing Aruna. good and healthy one . Very healthy and delicious curry..
Aruna, this is such a delicious dish..I must try this...mouth watering Dear..
Hmm this is our fav for breakfast...YUmmy yumm ..Goos one aruna.. Delicious chick peas gravy aruna ,like to have it dosa . Delicious n nutritious chickpea curry! I love it . Kadala curry looks really yumm. Delicious black channa curry..your recipe sounds great.Thanks for sharing dear. 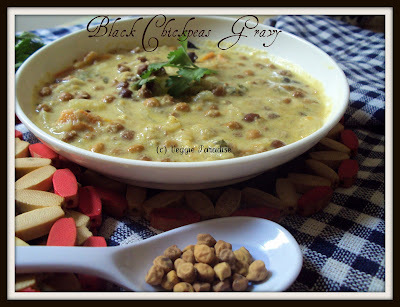 Very delicious black channa curry.Nice pic. yummy curry.I bet it tastes great with Appam..love to try it out sometime. Gravy looks rich and beautiful.. Wonderful curry..I would love it with appam and idiyappam..
looks so beautiful and delicious aruna. looks yumm..goes well with a wide range of dishes.. Sounds good and should be more flavorful and healthy! Wow....this looks wonderful and yummy. Mouthwatering. I wonder how the gravy tastes like. It is the first time I heard about this. Very nice, interesting, healthy and delicious dish. Thanks for your lovely recipe. delicious and very healthy curry..
Love this curry, very fulfilling recipe.